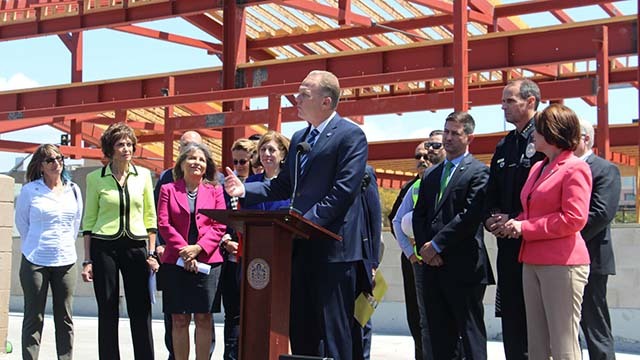 A triple increase in infrastructure spending compared to four years ago and a boost to police salaries and benefits are among the highlights of Mayor Kevin Faulconer’s proposed budget presented Monday to the City Council. The proposed $3.8 billion spending plan eliminates a projected $49 million deficit without significant cuts to major programs. Instead, departments were asked to streamline operations through “strategic reductions,” including the elimination of unnecessary positions. The proposed capital improvement budget of $553 million, including $76 million for 390 miles of street repairs, would represent a large boost over last year’s total of $445 million, and is triple the amount spent in 2014. Council President Myrtle Cole and Councilman Mark Kersey praised the proposed budget’s emphasis on infrastructure spending, particularly on sidewalk and street repairs. “Overall it’s a very good budget for rebuilding San Diego, which is obviously a priority. It has been for this council and I think that’s certainly reflective of what our constituents want to see,” Kersey said. Proposed infrastructure spending is approximately 15 percent of the overall budget. More than $28.3 million of projected spending would be reserved for San Diego Police Department recruitment and retention. About $17 million in salary increases and $11.3 million in flex benefits are intended to help fill the roughly 10 percent of vacant officer positions. Also, $666,000 would be earmarked for SDPD’s new Neighborhood Policing Division, intended to reduce chronic “quality of life” crimes often related to homelessness. Faulconer proposes $153 million for initiatives related to the Climate Action Plan, including $121 million to advance the Pure Water San Diego water recycling program. Nearly $8 million would go toward homeless services, including three large tent shelters, a year-round Father Joe’s interim housing program and the new Housing Navigation Center. The budget also would provide the highest level of library and recreation center operating hours in a decade. Two new library branches are scheduled to open in Mission Hills and San Ysidro. A handful of San Diego’s arts community members voiced their support for the budget during the public comment period at the council meeting. Compared to a 31 percent proposed cut last year, the 2019 proposed arts budget would only be cut 2 percent to $14.5 million. Councilwoman Lorie Zapf lauded the benefit of arts spending, which is funded, in part, by tourism taxes. “Arts and culture isn’t an extra — it’s in our charter to support this area. I think the amount of money going to these programs and jobs is really small… When we’re looking at increased tourism taxes, they come here because they want an experience,” she said. The city’s chief financial officer, Rolando Charvel, said the budget is structurally balanced, meaning ongoing expenditures are covered by projected ongoing revenue. City officials expect modest revenue increases of 3, 5.3 and 5.5 percent from sales, hotel and property taxes, respectively, during fiscal year 2019. The cannabis tax is also projected to bring the city $5.7 million during the upcoming fiscal year. Faulconer’s spending plan eliminates a projected deficit with $14.1 million in department cuts, $12.3 million in projected surplus from the current fiscal year budget and $5.6 million in excess funds from select reserve accounts. Reductions to police, fire and Storm Water Division overtime make up roughly half of the $14.1 million in department cuts, though services aren’t expected to be affected.